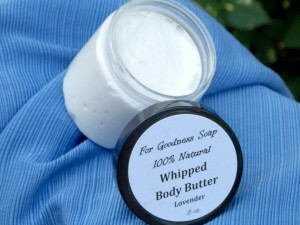 Time for me to release my recipe for Whipped Body Butter! I used to sell it, but I’m not selling anymore, so here it is, for the taking! Put it all in a glass measuring cup, mash it all up with your mixer (off), then start blending. You should be using a regular electric hand mixer, like you use when making cookies. Blend the junk out of it until it starts incorporating air. Then keep mixing on high until it’s reached about double in volume. Dip up a finger-full and test it on your arm. If it’s too greasy, add a little starch, mix and test until it feels right. Be careful, because too much starch will make it clump up and be too dry. But get your own feel. The above measures are the feel I like. It’s pretty fabulous, I gotta say.